Jackson imports started in 1990 after the success of the Charvel import series (1986-1991), which came out of the merger of Jackson and IMC. Jackson only imported neck thru Professional series MIJ guitars (the Pro models) in 1990 and 1991. 1992 started the importation of bolt on Professional series MIJ guitars. The serial numbers of the Professional series MIJ guitars are 6 digits long and will start with 0-5 with the first digit corresponding to the year (0xxxxx = 1990, 5xxxxx = 1995). There is an exception to this serial number format, Fusion model guitars (1990-1995) also have a 6 digit serial but will start with 90-95 with the first two digits corresponding to the year (90xxxx = 1990, 95xxxx = 1995). In 1994 (technically Christmas 1993) a new MIJ series started, the Concept series. The Concept series was only produced in 1994 and had the first 7 digit serial number scheme (94xxxxx). 1996 saw the end of the Professional series guitars and a new serial number format. All MIJ bolt on guitars received a 7 digit serial number starting at 9600000 increasing sequentially as more guitars are built, this system continues to this day for MIJ guitars (as of the start of 2010 the serial numbers are up to approximately 9850000). There is a slight exception to this format for several 1996 models. The new 7 digit MIJ serial system was suppose to start at the end of the Professional series which was suppose to end in 1995, but it appears a few Professional series guitars were made into early 1996. Some new "No Series" name MIJ guitars for 1996 (like the SDK-2, the Stealth EX, etc) received 6 digit serial numbers during this transition period while the Professional series was ended (there also are some Professionals that received 7 digit new format serial numbers and some new "No Series" guitars that received the new 7 digit serial number sequence  in their 6 digit serial numbers, so anything is possible during this transition in early 1996). The less expensive MIJ Concept series (produced Christmas 1993 to 1994) moved production to Korea in 1995 and became the Performer series. All MIK Performers were given a 7 digit serial number that starts with the number 1 (there is some speculation that they can also start with a 0, but I have not seen a 7 digit serial number starting with 0 as of yet) and were assigned serial numbers sequentially. Production of the MIK Performers ended in 1998 and the production moved to Japan in 1999. There is not a precise way of dating the production numbers across all four years of MIK production (I only have a few dates aligned with serial numbers as of right now); if you have a MIK guitar please post the serial number and any other information at http://www.jcfonline.com/forums/showthread.php?t=101420 so that one day we may be able to know production dates via the MIK serial number. The new "No Series" name MIJ guitars had a low priced student model companion, the JS20. The MSRP of the JS20 in 1996 was $325 and it could be purchased new for around $200 in the US at the time. A black JS20 (serial number 65002013) was my first electric guitar and my first Jackson, purchased new in 1996. The JS20 was initially made in Taiwan (MIT), India (MII), Korea (MIK) and Japan (MIJ). Serial numbers for the MIT JS20s are 8 digits long and the first digit probably denotes the year. No serial numbers are known except ones leading with a 6, so it is likely production of Jackson guitars in Taiwan started and ended in 1996. Serial numbers for the MII JS20s are also 8 digits long with the first two digits corresponding to the year (96xxxxxx = 1996, 99xxxxxx = 1999, 00xxxxxx = 2000, 04xxxxxx = 2004), JS20s are still made in India (as of 2010). Serial numbers for the MIK JS20s are 7 digits long and start with the number 1 (there is some speculation that they might also start with a 0, but I have not seen a 7 digit serial number starting with 0 as of yet), production ended in 1998 when the Jackson MIK production ended. Serial numbers for the MIJ JS20s follow the exact same format as all other MIJ serial numbers from 1996 on, they are assigned a 7 digit serial number which increases sequentially. I have never seen a pre-1998 MIJ JS20 and the MIJ JS20 appears to still be made today (2010). I suspect the move of the X series from Korea to Japan is why the MIK JS20s end in 1998 and MIJ JS20s appear to start in 1999 [speculation warning]. In 1998 Jackson started a new series called the X series, which was made in India. JS20s had been produced in India since 1996 using an 8 digit serial scheme where the first two digits corresponding to the year (96xxxxxx = 1996, 99xxxxxx = 1999, 00xxxxxx = 2000, 04xxxxxx = 2004). The new 1998 X series continued using this same serial number sequence until the X series ended production in India in 2001 and moved to Japan starting in 2002 (where it currently is made, as of 2010). End of year 2004, a new low cost student model series started production in India. In a very confusing manner, the new series was called the called the JS30xx series, which is not the same as the JS30 guitar made between 2002 and 2004. The new JS30xx series had low cost versions of the Jackson Randy Rhoads (JS30RR), the Jackson Dinky (JS30DK and JS30DKT), the Jackson Kelly (JS30KE), the Jackson King V (JS30KV) and the Jackson Warrior (JS30WR). The JS30xx guitars have fixed bridges (JT390), chrome hardware and two Jackson CRV2 humbucking pickups, except the JS30DKT model which has a licensed Floyd Rose tremolo instead of the fixed bridge. It appears some early JS30xx production guitars were given 8 digit serial numbers starting with 04xxxxxx identical to the MII JS20 guitars already produced in India. The normal serial number scheme for all JS30xx guitars is a 9 digit (or 10 starting in 2008) serial number where the first four digits correspond to the year of production (2004xxxxx = 2004, 2007xxxxx = 2007), many 2004xxxx serial numbers have been observed, so there is probably not a large number for 8 digit JS30xx guitars with 04xxxxxx serials (it is possible the 04xxxxxx marked JS30xx are prototype guitars and normal production JS30xx started with 2004xxxxx serials). At the beginning of 2008 a 10th digit was added to the normal MII 9 digit serial scheme (2008xxxxxx = 2008). Last edited by kc7txm; 01-02-2010 at 09:33 AM. The JS30DK/DKT/RR/KV/KE/WR series that was made for the 2005 catalog year had some guitars built in late 2004 (posts were made here on JCF in 11/2004). The serial numbers for those late 2004 JS30xx guitars appeared to follow the 9 digit MII (Made in India) serial scheme (2004xxxxx) we saw until 2008 when they added a 10th digit. It now appears that early 2004 JS30xx guitars made for the 2005 catalog year followed the 8 digit MII serial scheme that the MII JS line (JS20 / JS1) and the MII X series used since since 1996/1998 (8 digits with the first two digits denoting the year, 96xxxxxx=1996, 04xxxxxx=2004). Sometime early in the development of the new MII JS30xx series the serial scheme changed to the 2004xxxxx 9 digit MII serial scheme. There probably are few 8 digit MII JS30xx guitars because all the early guitar serials posted on JCF in 2004 and 2005 showed the 9 digit scheme. I will update the first post's FAQ accordingly. Last edited by kc7txm; 12-18-2009 at 06:32 AM. Update to FAQ: I am fairly certain the 10th digit was added to the JS30xx (MII) series starting at the very beginning of 2008. I have the serial of a very early 2008 that is 10 digits and a very late 2007 that is the original 9 digit serial type. I will update the first post accordingly. I am also removing the reference to MIK serials starting with 0 in the "Jackson Import Bolt-on serial number guide" section as I do not believe there are any examples of 7 digit MIK serials in existence (I believe they are being mixed up with 8 digit Indian serials that lead with 0 since they are both low cost production guitars, many of which models can be confused for one another), I kept the reference and made a notation about this issue in the "1995 the Korean Performers" section within the "Year by year serial number scheme information." Last edited by kc7txm; 12-22-2009 at 04:27 AM. I added a HUGE serial number scheme section to the bottom of the FAQ giving more detail about how the different countries serial number schemes are setup. Please post any additions (or corrections if needed). Last edited by kc7txm; 12-22-2009 at 04:31 AM. I now have enough samples to see there are both 6 and 7 digit Concepts, with most having 7 digit serials. 1994 MIJ Concept guitars should have a 7 digit serial number in the following format: 94xxxxx. The first two digits denote the year, MIJ Concepts were only made in 1994. There are some 6 digit MIJ Concepts floating around also, since the MIJ 6 digit serial number scheme would be the norm in 1994 that makes some sense. The majority of the serials I have seen are this 7 digit serial type. Last edited by kc7txm; 01-02-2010 at 09:35 AM. Why is this thread not a sticky? thanks to the OP for this most helpful thread, it helped me out on several occasions. But now I'm stucked a bit. There's a Dinky on ebay, it seems like a Dinky Reverse Professional from the mid-'90s: MIJ, JT-580LP trem, reverse Concorde headstock, Dinky body, H-H direct mounted pickups. But the serial is not so common: six-digit, starting with a 7. Is it a later, post-Fender model? Quite a lot of history in this thread as well. Sad it hasn't been updated in 2 1/2 years. No info then on the 6-digit serial starting with a 7...? 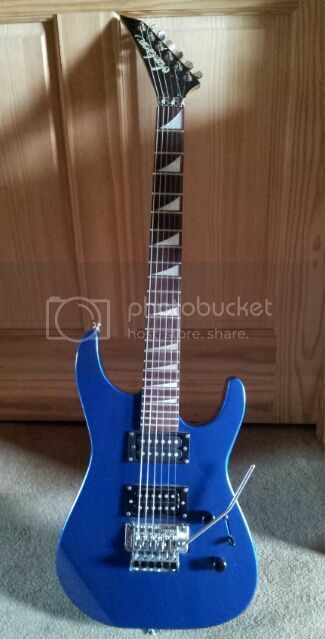 Not having much luck verifying this Jackson Guitar , has serial number 9850661 Been told it is a Japan DK2 any ideas if it's correct ? By that ser # it's a post 2007 Japanese bolt on. I just bought a korean bolt-on performer Kelly. Serial is 8 digits(!) and starts with a 0, 00070571. Is that made in 1997? The body is poplar or alder? Sounds like a parts guitar. Serial number indicates 2000 JS series guitar, not a Performer serial. Last edited by Hollywood; 07-31-2014 at 03:41 PM. Hollywood, pretty sure that's a DX10D. The serial shows 1999 made in India. Thank you for the help, guys...I appreciate it!